Pastel Hair Dye There are 35 products. For a delectable and delicate shade of pretty pink, you should look no further than the Crazy Color Semi-Permanent Hair Dye in Marshmallow Pink! Get the pastel locks of your dreams with the pale and interesting Stargazer Semi-Permanent Hair Dye in Baby Pink! Go for a subtle new hair colour with the lovely La Riche Directions Semi-Permanent Hair Dye 4 Pack in Pastel Pink. Who's got time for natural hair colours? 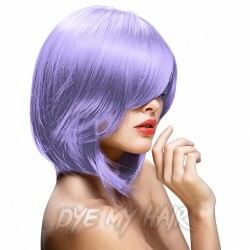 Be sure to check out the La Riche Directions Semi-Permanent Hair Dye 4 Pack in Lavender! If you're on the hunt for a pretty pale purple dye, look no further than the Crazy Color Semi-Permanent Hair Dye in Lavender, the perfect shade for any pastel prince or princess! For a pink dye that's as sweet as candy, look no further than the Crazy Color Semi-Permanent Hair Dye 4 Pack in Marshmallow, the ideal shade for any pastel prince or princess! For those looking for a soft and vibrant hue, Dye My Hair’s extensive range of pastel hair dye is just what you need! We offer a wide selection of gorgeous tones of pastel hair dye colors that are easily the perfect way to lighten up your look! A trend that has gained substantial momentum over the past few years, you’re guaranteed to get heads turning with a splash of pastel color! Boasting a highly elegant and almost fairy-tale like persona, pastel hair dye is perfect for those looking to make a statement. Available in a range of colors, such as Pink, Orange and Purple hair dye you’re sure to be stuck for choice when you browse our selection! Ideal for those looking to add a splash of soft color, La Riche prides itself on providing its clients with fashion explosive colors that are bound to get people talking! Offering a mild punk undertone, your look will surely never be the same once you’ve dabbled in these pastel colored hair dyes! Launched during the midst of the punk rock explosion, there’s no mistaking the irrefutable color showcased in their pastel toned dyes. If you’re seeking a funky new way to add a little edge to your style, then why not check out Crazy Colors pastel collection! With tones such as Marshmallow Pink and pastel blue hair dye, these light tones will give you everything you want from a hair dye experience. Locking in their delicate and desirable tones, you can rest assured that all of our temporary and semi permanent pastel dyes will leave your style fresh, fierce and full of color for up to 8 weeks! This means you don’t have to be constantly dyeing your hair, but you aren’t committed to a permanent hair color either. Much like all of our hair dye products available at Dye My Hair, pastel hair dyes compliment all natural hair colors, so gone are the days of those monotone and boring shades! Pastel shades offer up unlimited possibility for style exploration, so what are you waiting for?! Mix these colors with your natural hair, or other pastel colors for a perfect look every time. Two Tone: With its stark and juxtaposed finish, pastel tones work amazingly well when showcased in a two-tone finish! An ideal style for the festival season, it’s time to be brave and embrace the color! Dip Dye: A funky way to add a little dip of color to your natural shade, by adding a splash of pastel you’re look can be totally transformed! A blend of both sophistication and elegance, the hint of delicate color will leave people (and even you!) wanting more! Ombre: Although pastel tones aren’t considered ‘natural highlights’, who’s to say what you can and can’t do when it comes to dye experimentation? A quirky and alternative way to switch up your style, adding a light shade to your existing look can totally transform your look for the best! If we don’t have the perfect pastel shade for you, it’s not the end of the world! Why not try mixing your own to get that ‘perfect shade’. A simple process, achieved by mixing your chosen dye with the specially formulated Manic Panic pastelizer will let you evoke all those wicked styles you’ve dreamed about. Whichever pastel product your opt for, here at Dye My Hair we highly recommend that your hair is maintained to the best possible condition before you embark on the dyeing process. In doing so, you can rest assured that your hair is able to lock in those gorgeously fresh colors, keeping your style looking alive for much longer! Trust us, there’s nothing worse than watching your new style fizzle away! Plan Your Color In Advance - Although our extensive range of pastel hair dyes are suitable for all existing hair shades, bleaching and lightening might be a process needed to lighten your tone prior to application. We always recommend trying a patch test in advance so that you can truly be sure of the color you wish to achieve! Furthermore, as mentioned above – if we don’t have the shade you seek; why not mix your own! All you need is a pastelizer/white conditioner and a wicked shade of dye! Always Have Too Much Dye – Having more dye than you need is way better than running out half way through a job! Always make sure you’ve got enough to complete a full application before you start. Have Fun! – Here at Dye My Hair we are huge advocates for experimenting with color. With pastel colors, the sky really is the limit! Experiment until your heart’s content with our extensive range and why not even try mixing your own! So, what are you waiting for? Spring into action and liven up your look today with the help of our extensive range of pastel colored hair dyes! From lavender to pastel pink hair dye, we’ve got the perfect delicate hue to quench your dyeing thirst!